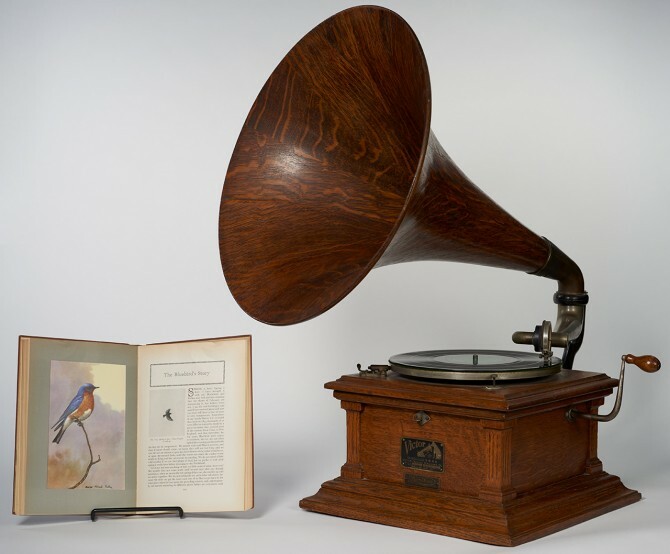 From whimsical 17th-century illustrations to game-changing gadgets like Thomas Edison’s wax cylinder-playing gramophone to the modern-day audiobook, Mixed Media: The Interplay of Sound and Text showcases artifacts that span centuries of capturing and conveying words and sounds. The exhibition opens Sept. 20 at the Hirshland Exhibition Gallery, Carl A. Kroch Library, with a reception from 4:30 to 6 p.m.
“This exhibition doesn’t attempt to be comprehensive in providing a history of sound technology or printing. Rather, I hope people will come away from it with a greater understanding of the moments in which sound and text production and representation have intersected and, in some instances, enhanced each other,” said Julia Gardner, head of research services and assistant curator at the Division of Rare and Manuscript Collections, who organized the exhibit. In tracing the crisscrossing paths of print and acoustic technologies, Mixed Media takes many colorful turns, including early meditations on the morality of music, debates about sign language versus lip reading, and the intimacy and secrecy made possible by portable reading and listening devices. The exhibit also includes artifacts from researchers and professors at Cornell, such as Frederick Bedell, who studied and designed hearing devices; and Paul Kellogg and Arthur Allen, who – in the bulky, early days of field recording – captured birdsongs across the country in an equipment-loaded van that often scared away the birds they were recording. Free and open to the public, Mixed Media will be on view through March 8, 2019. The Stephen E. ’58, MBA ’59 and Evalyn Edwards ’60 Milman Exhibition Fund supported the exhibit.